Summer of 2018, I had just wrapped up an awesome month-long program with The Residency as I got into ALLI, the Arts, Leadership, and Liberation Institute. It’s a two-week intensive summer program put on by Arts Corps, Youth Speaks, Massive Monkees, and Totem Star where 28 youth are trained in artistry, social justice and organizing. 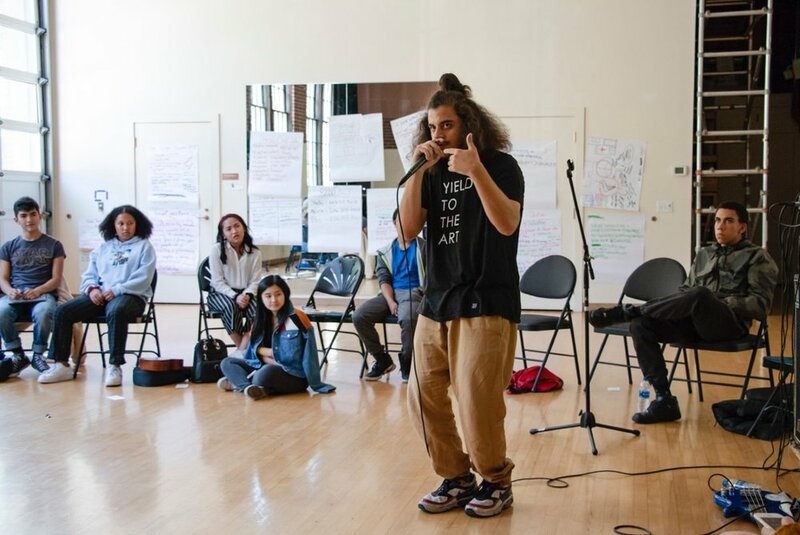 Youth leaders develop as cultural workers in four arts pathways: spoken word poetry, music production, visual art and breakdance. This cohort of youth hones their arts and organizing skills, while deepening their understandings of race and social justice issues. They collaborate, build community and create art that challenges oppression and envisions a more just world. Personally, I chose the music pathway, as I wanted to learn more about how to be a DJ. But anyways, that article isn’t about me. I’m here to talk about the program, and boy, was it dope. At the beginning of each day, we’d have everyone in one room to partake in different activities, meshing social justice and art in our work. For example, on one day, we were split into different groups and had to work with a quote that was given to us by the teaching artists. My group’s quote was about Revolution, and we had to create a performance piece that included all 4 pathways and perform it in front of the other groups. Overall, the activities were really good at giving youth the inspiration and creative path to fuse art, in its various forms, with elements of social justice. In each pathway, youth would practice on refining their craft but also delve into unknown territory in terms of new skills to learn. For me, before ALLI, I had ZERO knowledge on how to DJ and what it takes to mix music. By the end of the two weeks, I was able to DJ a 30 minute set in front of over 100 people. I also grew a passion for DJing and now get to DJ at other events. The day of the ALLI showcase, we had many people from the community come to see what we’ve been working on. They got to see a gallery of paintings made by the visual art pathway, and also attend an open mic that was hosted by two of our poetry pathway students, Bitanya and Suraya. For the show itself, which was hosted by Kid LIO, every ALLI participant got to shine on the stage and share their unique experience through their art.